I landed in London on Monday morning. It was 8:30AM or so by the time I came out of the airport. A slight chill (~15 Deg. Celsius) in the air, few vehicles on the street (Monday was a bank holiday in London), I realized that I was liking the city. Despite my horrible immigration experience, where 4 people were handling immigrations for 6 simultaneous flights, I was, fairly soon, thrown into a city with some beautiful buildings, narrow paved streets and people walking around in all kinds of dresses (formal and informal). What took me in the most is the architecture. The hotel I was staying at – Radisson Mountbatten, can be called an average hotel, the likes of which you find quite a lot in places like NY – nice and good, small rooms, basic functionality kinds. Not the expansive rooms that Indian hotels have, but comfortable and functional. 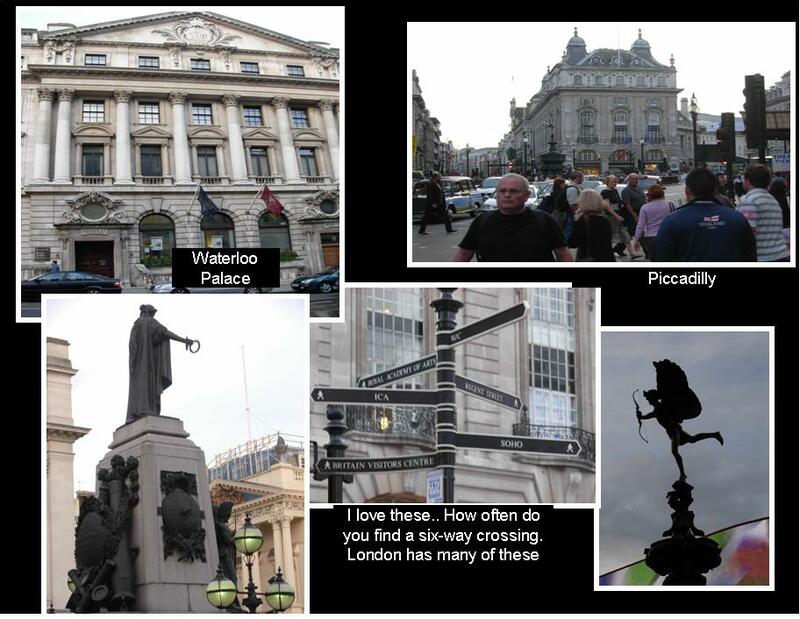 The hotel is in the heart of the Central London – a few blocks from Trafalgar square, Leicester Square, very close to Covent Garden, Theater Lane, China Town, etc. A couple of miles off is the London Eye, Westminister Abbey. The office was a couple of small blocks away. Office being on the 10th floor of a Central London building, there are some excellent views available from the meeting room windows. That far was the background. Now, let me tell you what I did. Morning: After refreshing myself a bit, I went out with Bee and Ranjeetha. They had come to pick me from the hotel. We went to their place first, grabbed some breakfast, and then moved out. We want to Kent to meet Crap, and found that he had taken a break to vegetate in his room. And vegetate he did with a huge 43′ HDTV, a fully integreated home theater system with DVD player, VHS tape player, speakers etc and a complete collection of Star Trek- The Next Generation video tapes. We bull-ed around for some time. 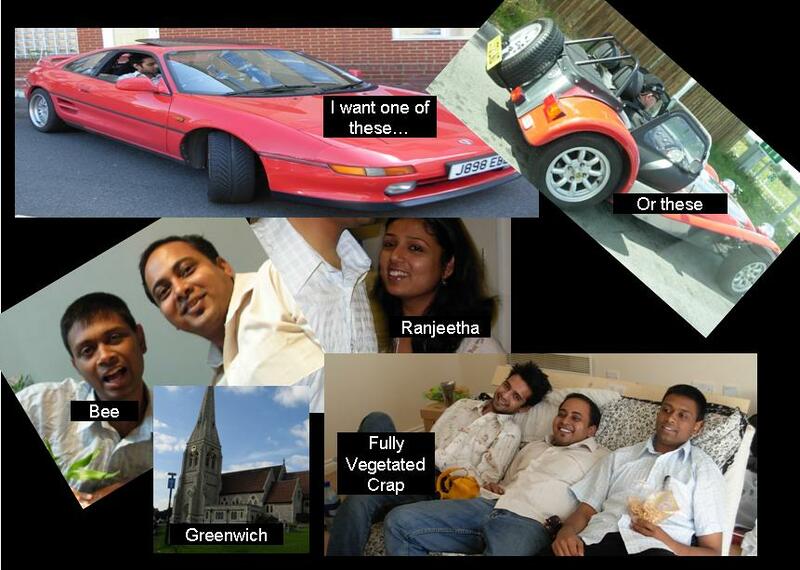 Discussed random things, before checking out his newly acquired prized possession- a Toyota Sports Car – 220BHP, 2000 CC, red color, car for just 1000 pounds. It was a steal, I say! Considering he would break even on this investment in just 2 months, and he gets to be a proud owner of a sports car! Lunch: After this nice meet-do we started towards Greenwich where I saw people trying to control kites that were as big as parasailing balloons. Nice.. Moved to have lunch at a nice Italian Lunch at Bella Vista (not that I would recommend this restaurant to a lot of people, but it was a decent change from the Indian Italian I am used to). Came back to Bee’s place to see India almost losing the match to England (they did lose the match eventually). Finally, I was dropped back at the Leicester Square station by Bee and Ranju. I was supposed to call Alex now, who had been waiting for me all day long. I had somehow managed to get a slip so far. But not for long. 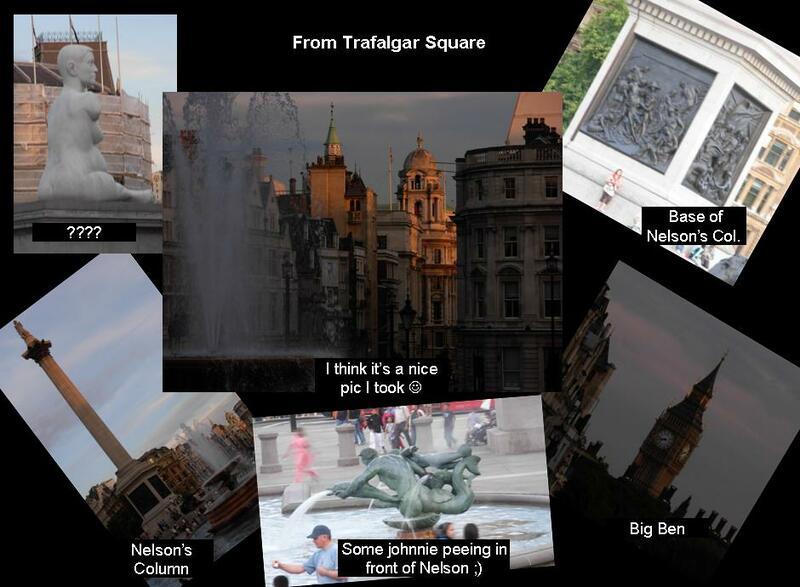 While trying to find his hotel, I passed Trafalgar square three times and saw and enjoyed almost everything that is there to be enjoyed. Its a nice place to spend an evening just chit-chatting and looking at the victorian architecture surrounding the place. Evening: After locating Alex, we grabbed a cuppa at Starbucks, chatted about different things, and how Partner was in love with the city of London because there was so much activity, so many colorful people and I am sure there would have been several other reasons (yeah.. the description of all the women he liked) if I had shown even marginal interest in knowing what the reasons were! Just as I fear on such occasions, our conversation quickly moved to official stuff and I reminded myself that the workaholic me hasn’t thought about the next day. So, we got back to business, went back to his hotel, and started working on the two decks that we were supposed to be working on. Finished that by around 9PM and came out for Dinner. Dinner : When in Rome, do the Romans. I wanted to have an “English” Dinner. 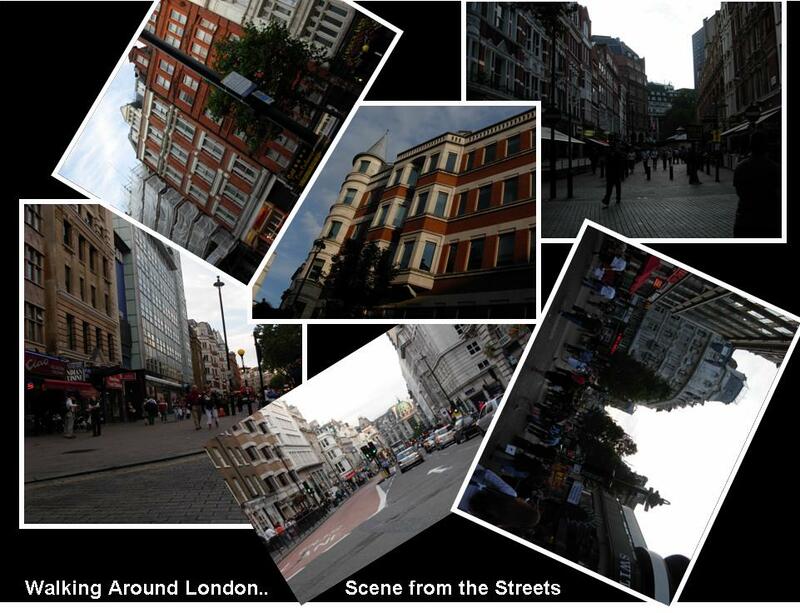 The first three places that we went to, had their kitchen closed at 9PM, Monday being a holiday in London. Finally, we went to a Garfunkel’s. Now, Garfunkel is like the English cross between McDonald’s and TGIF. I dont know if TGIF is also an English chain though. It serves standard fare, has outlets in every third corner of London, serves breakfast, lunch and dinner along with nice Alcohol. I went about the business with a nice order of Chicken Kiev and Diet Coke. Partner ordered something to suit his palette. And I realized something that I had been thinking about all through the day. English people are Europeans! They take 25 minutes+ to serve your order. And the whole dinner/lunch affair is usually upwards of an hour. Everything is done at a leisurely pace. Nice! MKOP. Good night! : I came back to my room at around 11 in the night, drained of energy and a sagging mind (it was 3:30AM IST! What do you think??). Still unable to sleep, I think I got about 2-3 hours of sleep till about 6AM. And the last note here, is that you guys should definitely listen to the “Jana Gana Mana” album by A R Rahman. Awesome!! Its difficult to channel so much creativity together. Over 20-25 great artists giving voice and soul to the national anthem in their own way. Simply mindblowing stuff.